Inland Market is a division of Inland Seafood, one of the country’s largest processors and distributors of fresh fish and seafood. id8 has worked with Inland Seafood for many years to develop a string of successful product campaigns. 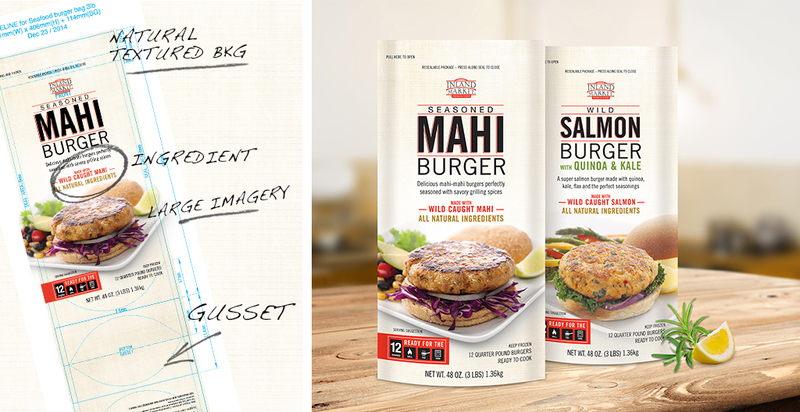 On the most recent project for Inland’s Seafood Burger product line, two new flavor varieties were introduced to the market. A Kale, Quinoa and Salmon burger and a seasoned Mahi burger were rolled out in the first quarter of 2015. With the introduction of these new seafood burgers, families can now enjoy a healthy seafood meal anytime. id8 also continued to extend Inland market’s line of dip, salad and spread products for Costco stores with the introduction of a Blue Crab Spread and a Maine Lobster Spread. Both spreads have been well received by new consumers, and the entire line remains a constant household staple for many. As many consumers continue to look for convenient, healthy meal choices, Inland Market prides itself on being a step ahead on what consumers will crave next. id8 helped extend Inland Market’s pre-packaged fish product line with the introduction of several delicious new seafood combinations, packed in convenient, grab & go trays with freshness you can see.